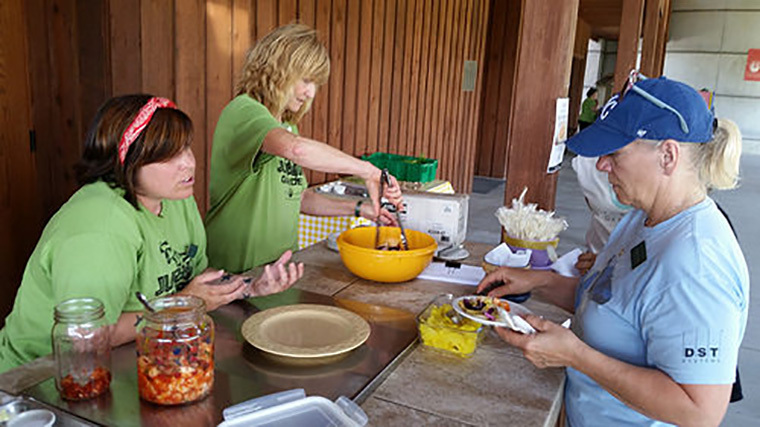 Cassie Doolittle (left) and Barbara Fetchenhier served guests two types of kimchi during Fresh Bites.Barbara Fetchenhier (AKA Barb the Gardener) brought in a special guest to lead today’s Fresh Bites. Cassie Doolittle, who is a gardener in Powell Gardens’ Heartland Harvest Garden, lived in Korea for four years. She is a fabulous cook and today she shared two kimchi recipes with guests. Cassie prepared Kkakdugi, a radish kimchi, and a cabbage kimchi called Baechu Geotjeori. Both are incredibly flavorful and easy to make. 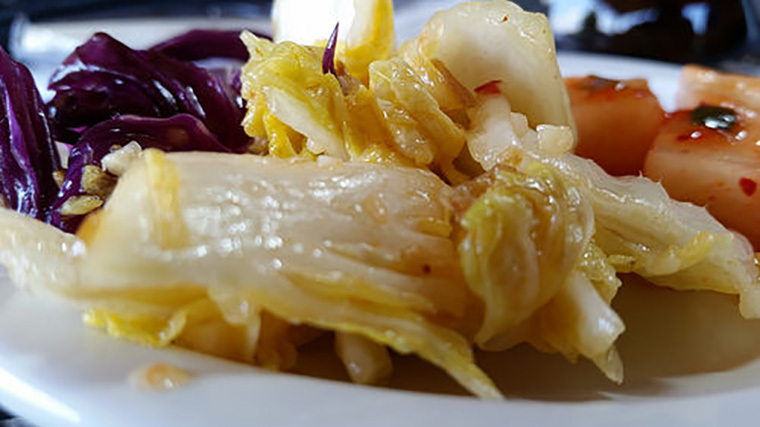 Below is the recipe for Cassie’s cabbage kimchi, which does not require fermentation. Place cabbage and salt in a large bowl, tossing gently to combine. Weigh down cabbage with another bowl. Let stand at room temperature for 3 hours, tossing occasionally. Drain and rinse with cold water. Drain and squeeze dry. Combine cabbage, sesame seeds and remaining ingredients. Cover and refrigerate at least 4 hours before serving. Cassie serves this as a side (it’s perfect for a picnic), in stir fry, or added to rice or noodles. Enjoy! 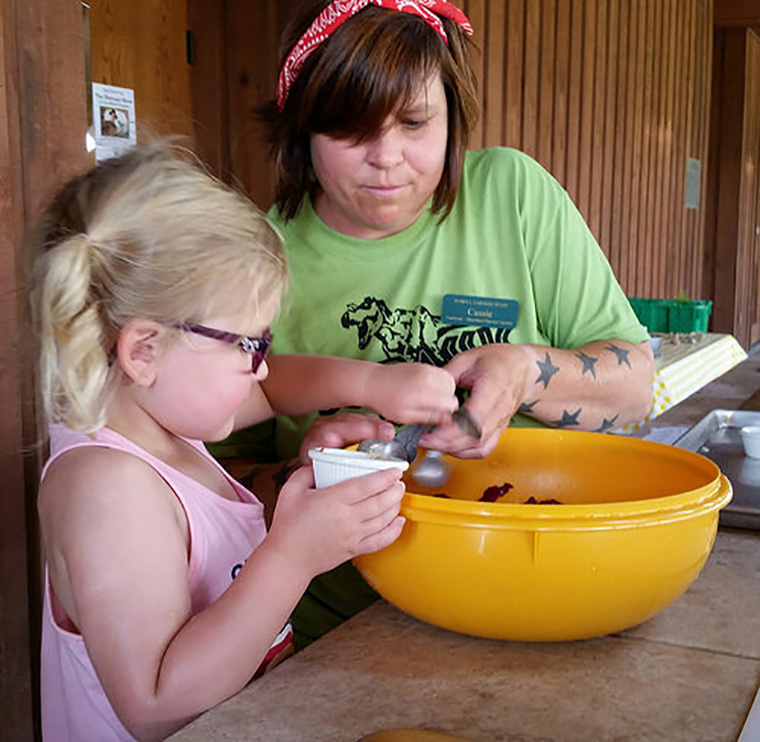 Thank you to Harper (left) for helping Cassie with today’s Fresh Bites demo!